F-35 Integrated Test Force, Edwards AFB, Calif. test pilot Maj. Charles “Flak” Trickey fired the GAU-22/A 25mm gun from F-35A aircraft AF-2 in the first aerial gun test operating on the China Lake, California, test range, Oct. 30. The F-35A Lightning II completed the first three airborne gunfire bursts from its internal Gun Airborne Unit (GAU)-22/A 25mm Gatling gun system during a California test flight, Oct. 30. This milestone was the first in a series of test flights to functionally evaluate the in-flight operation of the F-35A Conventional Take Off and Landing variant’s internal 25mm gun throughout its employment envelope, a major event towards certifying the gun for use in the F-35A, and a key component for reaching U.S. Air Force Initial Operational Capability in 2016. F-35A test aircraft AF-2, a loads-instrumented jet, underwent an extensive structural modification at Edwards Air Force Base, Calif. to a fully production representative internal gun configuration. 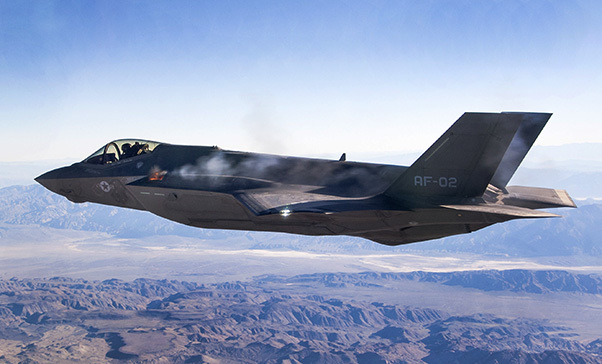 The first phase of test execution consisted of 13 ground gunfire events over the course of three months to verify the integration of the gun into the F-35A. 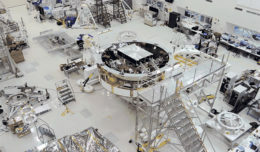 Once verified, the team was cleared to begin this second phase of testing, with the goal of evaluating the gun’s performance and integration with the airframe during airborne gunfire in various flight conditions and aircraft configurations. The 25mm gun is embedded in the F-35A’s left wing and is designed to be integrated in a way to maintain the F-35’s very low observable criteria. It will provide pilots with the ability to engage air-to-ground and air-to-air targets. The first phase of F-35 gun testing started in June, when initial shots were fired from the ground at the Edwards Air Force Flight Test Center’s gun harmonizing range. The gun system will be further tested with a production F-35A next year for integration with the jet’s full mission systems capabilities. The test team will demonstrate the gun’s effectiveness in both air-to-air and air-to-ground employment when integrated with the 5th generation fighter’s sensor fusion software, which will provide targeting information to the pilot through the helmet mounted display. At the end of the program’s system development and demonstration phase in 2017, the F-35 will have an operational gun. The F-35 Lightning II, a 5th generation fighter, combines advanced low observable stealth technology with fighter speed and agility, fully fused sensor information, network-enabled operations and advanced sustainment. Three distinct variants of the F-35 will replace the A/OA-10 Thunderbolt II and F-16 Fighting Falcon for the U.S. Air Force, the F/A-18 Hornet for the U.S. Navy, the F/A-18 and AV-8B Harrier for the U.S. Marine Corps, and a variety of fighters for at least 10 other countries. Following the U.S. Marine Corps’ July 30th combat-ready Initial Operational Capability (IOC) declaration, the U.S. Air Force and Navy intend to attain service IOC in 2016 and 2018, respectively. More than 160 production F-35s have been delivered to customers and have flown more than 42,700 flight hours, fleet-wide.